* It’s a witty synopsis of my philosophy for life; that to be successful in life, HOPE must be ‘put to work’ on a daily basis. * It’s the brilliantly catchy name and residence of my hope-filled blog. Inspired by my last name, I’m on a journey to better understand the intertwining of FAITH & HOPE. Not the wish-and-a-prayer type of hope that we so casually add into conversation. I’m talking about the kind of HOPE that undergirds and gives substance to FAITH. That’s the stuff that by faith brings the things hoped for into being, as referenced in Hebrews 11:1. Yes, that is the kind of HOPE that I want, and on a daily basis I look to my God to help me HOPE-WELL! I invite you to take a stroll around the website and enjoy. I am literally overwhelmed and moved to tears. There have been so many times during the last 6-9 months that I have wondered if I should continue blogging or not (questioning if I was actually reaching anyone by sharing my story). But He just kept prompting and prompting (and prompting some more! Lol) until I finally surrendered and started blogging again. 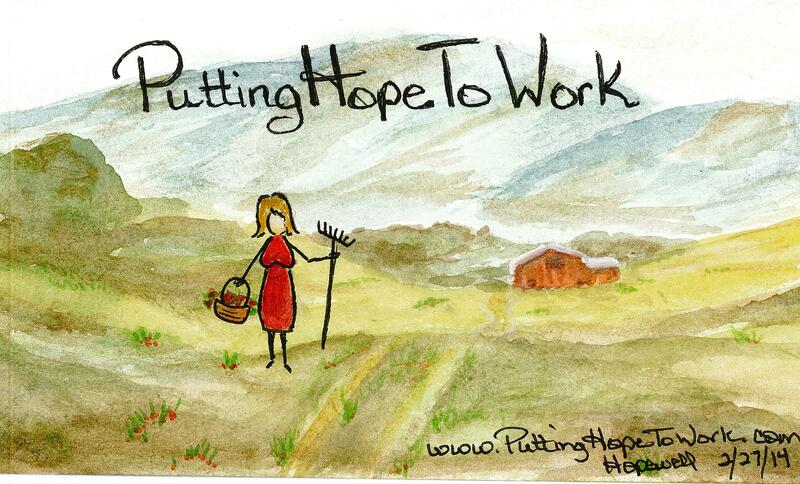 Your featuring PuttingHopeToWork is a tremendous encouragement to my spirit. Thank you so much and may the kindness be returned to you many times over!!! Ahhh, you’re most welcome! You should definitely keep blogging (if your circumstances allow), and I’m glad you’re encouraged! There is a lot to learn in the world of blogging and I highly recommend the WordPress help pages if you are looking for ways to reach more people 🙂 You already have a really healthy number of followers though! God bless and have an awesome day. Hey there Jenny! Thanks for stopping by my blog and taking the time to read. That is encouraging. I have been poking around your site. You know what I love the most? The picture on the front page. When I looked at it I thought of Jesus’ words about seeds. There you are, rake in hand, prepared to cultivate the seeds that God spreads in the fields of your life. Keep on cultivating! 🙂 That is exactly what I was trying to portray. Thank you!